Gettysburg High School seniors got a first hand look at county government on Tuesday, Feb. 5 as part of the annual student government day. The event is organized through the cooperation of the American Legion Post 135 and GHS instructor Mr. Keith Scott to give students the opportunity to learn more about local government. The students spend the afternoon with elected and appointed officials after joining for lunch provided by the American Legion Auxiliary. 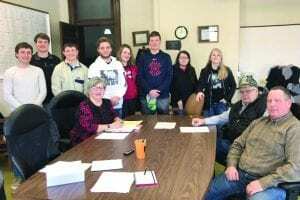 Pictured are the students who spent the day with the Potter County Commissioners. Standing are (l to r) Cole Nafziger (Kris and Deb), Dawson Simon (Pat and Diane), Taylor Frost (Cindy and Don), Bishop Meinke (Danny), Amber Flatt (Theresa and Kenny Goebel), Shad Sharp (Missy Meinke/Matt Sharp), Shaylee In The Woods (Jenny Thomas), and Shaelyn Schatz (Sheila Schatz/Mark Schatz). Seated are commissioners Sandy Hagny, Ken Iverson, and Jesse Zweber.